A growing body of literature provides estimates of ecosystem services values derived from mangroves. If this literature is to be useful in decision making, it must have a solid foundation of value estimates. 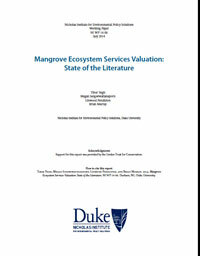 This paper identifies gaps in data and knowledge regarding mangrove ecosystem services valuations and recommends ways that future research could advance understanding of mangrove ecology, ecosystem services valuation, and conservation.